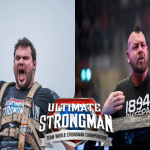 Gatineau, Canada – 6,000 fans packed the arena for the first day of the Ultimate Strongman U23 World Championship. It was Zydrunas Savickas trained Martynas Brusokas of Lithunia who laid down his marker early, winning the first event – the Giant Tyre Flip. 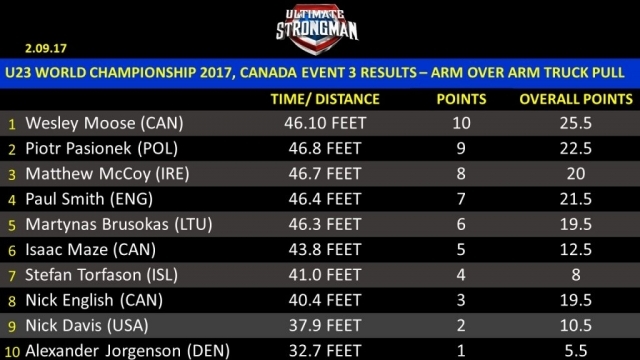 The Big Z technique was evident as he beat the rest of the field by nearly 20 seconds. His winning time 36.11″. 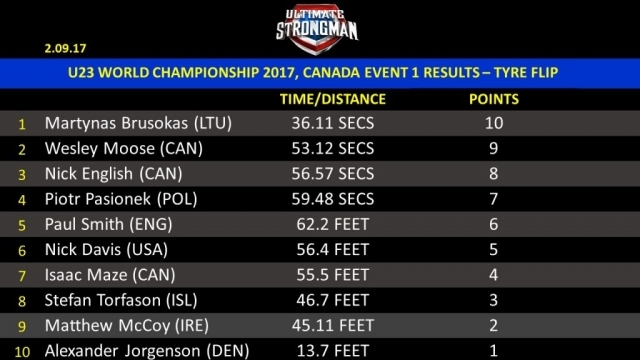 Canadians Wesley Moose and Nick English took 2nd and 3rd respectively. The second event of the day, the silver dollar deadlift, proved to be the highlight. 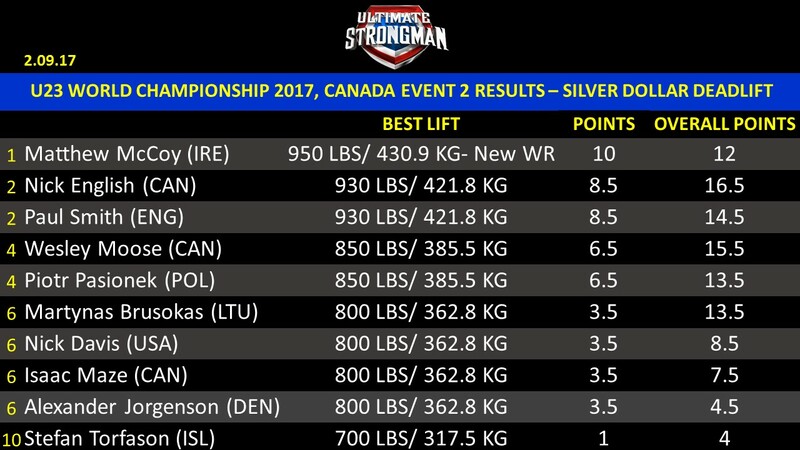 All 10 competitors cleared the first two rounds, 600Kg and 700kg, before the field started to drop away. It all came down to 3 men – Nick English (Can), Paul Smith (Eng) and Matthew McCoy (Irl). All three pulled clear at 875lbs/397Kg , and then matched each other at 900lbs/408Kg. 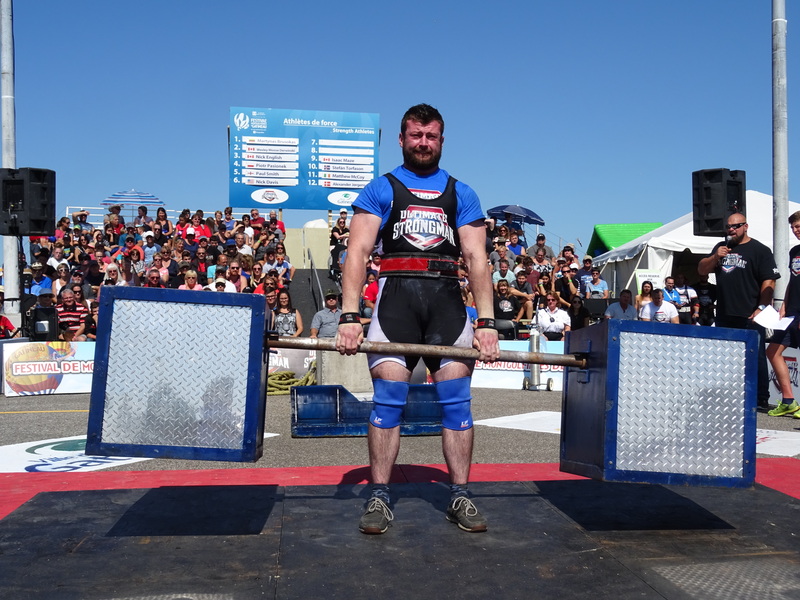 A new world record weight of 930lbs/421Kg was set, and it was McCoy, at 105Kg the smallest man, who was up first, and to the delight of the fans broke the record – 4 times his own bodyweight. 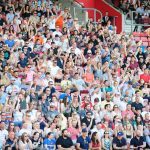 England’s Paul Smith, the previous world record holder, was up next, and matched McCoy’s record as the crowd erupted once more. 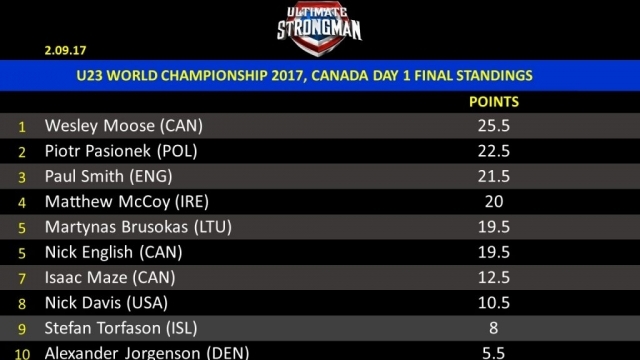 Canadian Nick English wasn’t going to go out without a fight, with headphones on he stepped up and matched McCoy and Smith to set up a showdown at 950lbs/431Kg. McCoy said he wouldn’t attempt the weight, but a stern talking to from his older sister saw him step up first as the crowd chanted his name – they love him over here. McCoy set himself with his knees at shoulder width but hands in a narrow position and pulled to set a new world record once more and lay down the gauntlet to Smith and English. It wasn’t to be for them however, and McCoy took his first win of the championship (he won 2 events here last year). 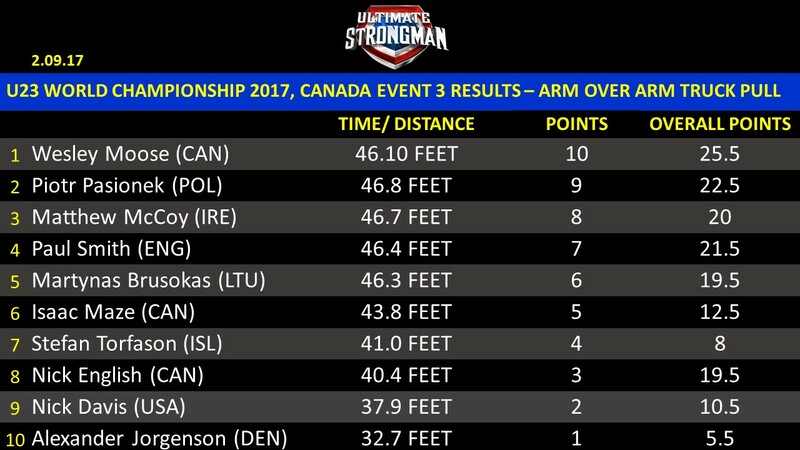 In the final event, the 44,000lb arm over arm truck pull, Canada’s Wesley Moose won ahead of Piotr Pasionek and Matthew McCoy. Full results below.